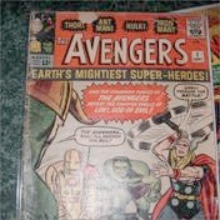 The Avengers book #1, published in September 1963, by Stan Lee. Good condition. It is all there, every page. Easily readable. No large rips or tears. Words are still clear. No fading as far as words or pictures. Images are still very sharp in color. Some creases along the spine. Just two fold marks on the front cover, one on rear cover, none throughout the book. Slight deterioration along the edges. Editor's reply: Thanks for writing. 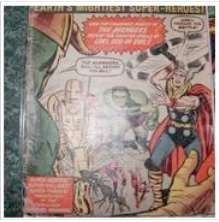 This is a landmark comic book, and it's only got more appealing since The Avengers movie was launched. Your Avengers #1 is quite worn, but the worst fault I can see from these pictures is the missing color patch at the top of the cover. It's hard to grade from these pictures -- ideally I would have larger photos showing all the corners, and the back cover as well -- but I am going to estimate it about 2.0. Click here to check prices for this comic. If my grade guess is correct, then that values your comic book at around $550-$600 as-is. If graded by CGC, it will be worth nearer $900. Though of course the men at CGC might give it a different grade. I can't see it being much lower than 2.0 though.